There is always something happening at the Festival Centre. It hosts various events covering spectacular visual art, theatre, children’s shows, dance and musical performance. The Centre has 4 main spaces, the Festival Theatre, Dunstan Playhouse, Space Theatre and Amphitheatre. Her Majesty’s Theatre located at a different venue on Grote Street is also part of the Adelaide Festival centre. 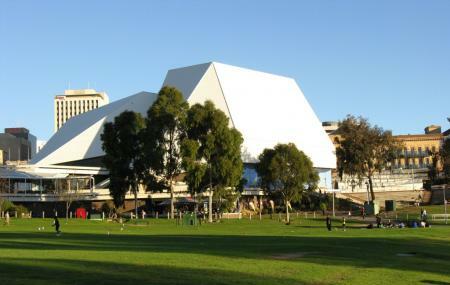 The popular Adelaide Cabaret Festival, The OzAsia Festival and The biennial Adelaide International Guitar festival are held here. There are “behind the scenes” tours of dressing rooms and theatres held on Tuesdays and Thursdays. The venue also has bars and restaurants for pre-show drinks and meals. Admission charges vary for different performances and tours. Wheelchair Access & Hearing Aid Facilities are available but need to be mentioned at the timeof booking tickets. Festival Centre's Artspace Gallery Timings – 12 pm to 5 pm. Behind the Scenes Tour Timings – 11 am (Tuesday & Thursday). How popular is Adelaide Festival Center? People normally club together Skycity Adelaide Casino and South Australian Museum while planning their visit to Adelaide Festival Center. Some renovations make it a bit tricky to get in but once you're inside and ready to watch the show you forget all that. Loved being able to preorder my drinks for the intermission... Great service. Brilliant venue. My only problem was the aircon was too cold for me. Distracted a bit from the show. But I find that everywhere in the summer. Otherwise faultless. Amazing acoustics. Good views from anywhere. Comfortable seats. Good food if you want dine first. The performance of North by Northwest was an absolute delight. The Festival Theatre is an excellent venue BUT actually getting to the theatre by public transport, which should be encouraged, was horrendous on a day of such extreme temperatures. Surely, when the public are being encouraged to take care in such conditions, the underpass from the railway station should be open in the interest of public safety? If it can be used for such events as sports at the Adelaide Oval then it's obviously possible.